To carb watchers and calorie counters consuming bread is often a big no-no. Unless, for reasons like allergies to gluten or some other condition, negative attitudes toward regular bread constitute high treason in our book. And so, we’d like to take a little time to celebrate the magic that is bread. How about making croutons for your soup or salad? You can make stuffing for poultry. Make breadcrumbs for topping off some ooey-gooey delicious macaroni and cheese. Use breadcrumbs to fry fish or coat fried chicken for Sunday dinner. For Jamaicans, bread with fried fish, avocado (pear), porridge, or jerked pork are just natural pairings. Pick Up a Loaf Today! 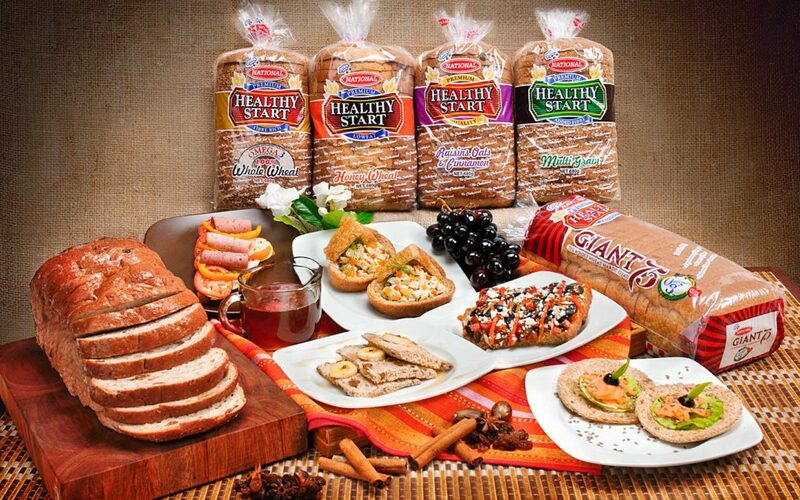 You’ll find a variety of loaves from National Baking Company in wholesale and retail shops islandwide. By expanding our distributions centres overseas, our products are now available to Jamaicans in the US & UK. Or shop online, anytime! Available as sliced or “hardo”, white or brown loaves, our breads are delicious and nutritious. Bread gets a bad rap — it’s all about moderation. We’re proud to support heart health, so check out the honey wheat, multigrain, and raisin oats and cinnamon options in our Healthy Start line. Next time you‘re getting grocery, look for our dinner rolls, hamburger buns and hot dog rolls, too. Get social, and let us know which of our breads is your favourite or share how you love to eat them. Chat soon!